Are there any other choices out there? Thanks for the information on price. At this point in my process, I am trying to determine if there are other options other than Nicova and Stowaway. 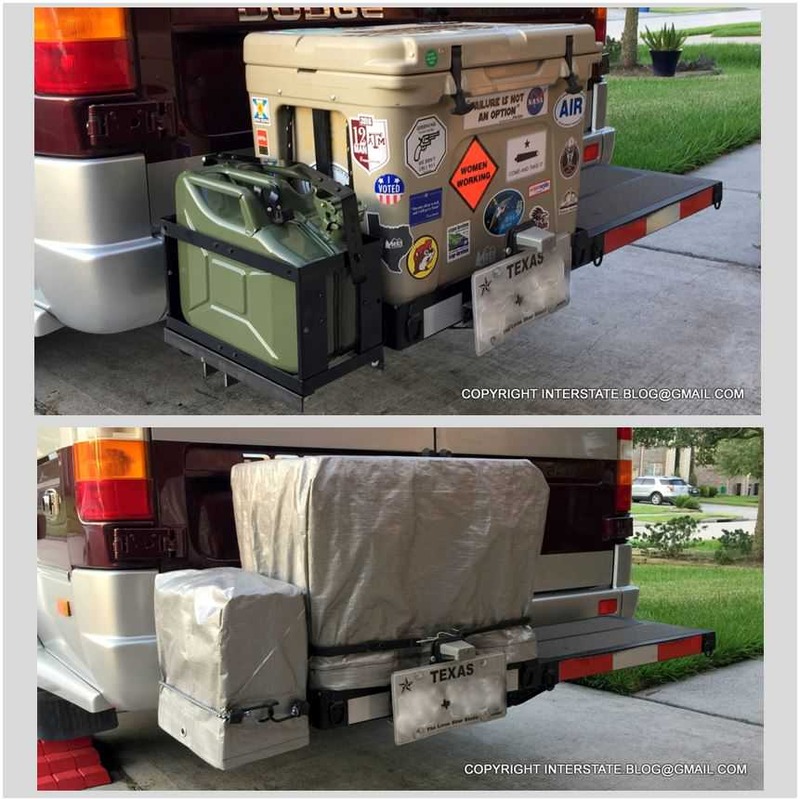 What are folks using for cargo boxes? Thanks! Thule and Rola are another hitch cargo containers. Your question is perhaps best answered within the context of what you wish to use a cargo box for. Do you wish to use it to haul twenty dollar lawn chairs, or a two thousand dollar folding bike? Or something in between? It matters because there are many different ways to go with a product like that. Class Bs are so small that it is often inefficient to solve problems speculatively, as one would with a stick-and-brick house (because there's so much space that mistakes in storage efficiency hardly matter in a house context). Rather than asking the forward question (which brands), I encourage people to do the inverse (state their objective and then work backwards to isolate the solution). Thank you for your feedback. And thank you, Interblog, for the very good question, "what am I hauling?". I plan to haul two (2) $2,500 folding bikes and potentially other smaller items in a bucket or plastic box containers without overextending the weight limit of the cargo box. Thank you for your time and feedback. ... I plan to haul two (2) $2,500 folding bikes and potentially other smaller items in a bucket or plastic box containers without overextending the weight limit of the cargo box. Thank you for your time and feedback. That ^^, IMO, is a game-changer. If I were you, I'd think very carefully about the solution to your needs. And think outside the box, literally. Understand that a Stowaway (and similar products) is just that - a flimsy plastic box. It can be defeated in a matter of seconds by a thief with a simple crowbar. Maybe you're not planning to go very far from your rig with the bikes still in the carrier. But if you even stop for lunch at a restaurant, go inside a convenience store to pay for fuel, it can happen that fast. Forums, websites and Instagram are riddled with stories of Class B owners who had their vehicles burgled and their most valuable items stolen in the blink of an eye. My husband and I needed to carry a Yeti cooler which is also a high theft target, but considerably less money to replace than folding bikes (about $400). But add to that the cost of special dietary requirements and a lot of expensive home-made block-frozen food for the journey (a few hundred $ more) and all of a sudden we're talking about an investment that I don't care to lose. We couldn't find any hitch carrier that would even come close to providing sufficient security without adding too much weight, and so we designed and made one ourselves. It incorporates thick iron bars that hold down the Yeti and a Pewag chain that lashes the carrier itself to the chassis because hitch locking pins themselves are extremely vulnerable - one smack with a sledgehammer and the entire hitch assembly is free for the thief's taking (carrier's build series of blog posts here). The materials to build the hitch carrier above were only about $100. The real cost, of course, is in the labor, which in our case was DIY (my husband has a welder), but you could design a carrier and work with a local hobbyist "weekend welder" and probably pay him/her not that much more for labor than what you'd pay for a plastic box such as Stowaway off the shelf. A lot of these hobbyists like to earn a little money on the side because welding is an expensive hobby and their wallets gotta be fed. On the topic of folding bikes generally, if you feel you must carry them outside the van, I suggest either opting for a metal box with a robust lock, or, a far heavier gauge molded box than what companies like Stowaway offer. If you got one of the larger fishing coolers for instance, you could adapt that to a hitch carrier. I also added internal security to the closet that I don't show in the blog post. I've been pretty happy with that arrangement. The bike is more valuable to me than my clothes, literally and figuratively. Clothes can get stuffed into an overhead compartment. The bike needs to be protected. The Nicova is likely still unique as it allows you to carry bikes on top of the cargo box. I don't think that two folding bikes would fit in many of the known cargo boxes. There are some oversize boxes out there. You'd have to certain of the measurements if ordering online. Carrying bikes on top of the cargo box is an efficient use of space if trying to limit the overall length of the rig assuming that you need a cargo box for other items anyway. Marcopolo, Thanks for the reply. I don't think I want to carry the bikes on top of the carrier. A few years back, we had a Class C and and hauled our Treks on the back of the rig from Washington, across the northern US, up to the beautiful Atlantic Provinces, and then down the eastern coast following the fall foliage. Even covered, the Treks took a heck of a beating. 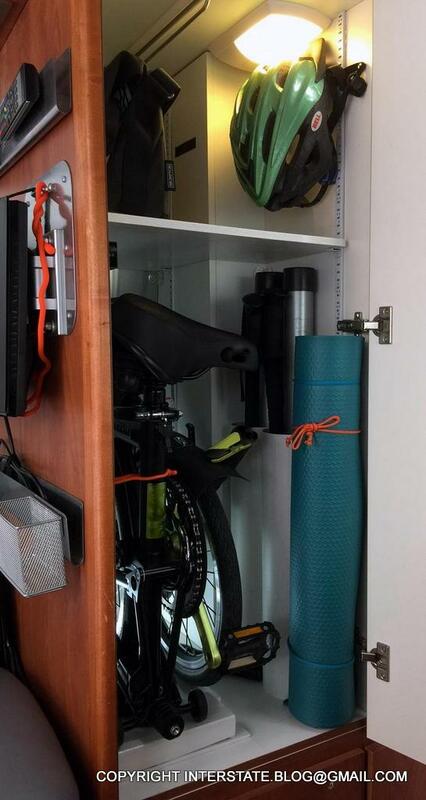 I will triple check space requirements for the bikes before purchasing or having a box built. Thanks very much! FWIW, we loved NB and especially the St. Andrews area. Beautiful. Interblog, Thank you very much for the detailed description, photos, and the the link to your blog. Much appreciated. You have given us much to think about. Fortunately, 'we know a guy' that could likely help with building our own designed box. I would love to try and fit the bikes 'inside' but I don't think there is enough room. Thank you very much for the detailed description of your set up. Happy Travels.